This was our 4th tour with Redspokes and having thoroughly enjoyed the previous 3, this trip did not disappoint. 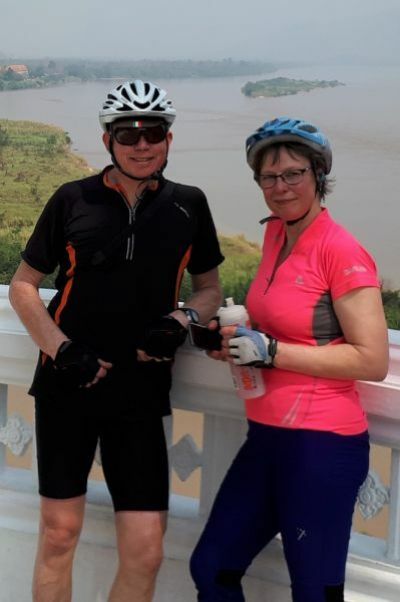 The cycling is stunning, well surfaced roads, very little traffic, beautiful scenery and plenty of challenging climbs followed, of course, by exhilarating descents. The small towns and villages through which you pass are fascinating. The rest day in Chiang Kham is a particular treat, we were absolutely spoilt by the resort owner Rico and would love to go back there sometime. The real highlight of this trip however is the guide Preecha, he epitomizes the friendly open nature of the northern Thai people and is someone you will not forget. This was as much a gastronomic tour as it was a cycling tour. During the day we stopped at roadside cafes for delicious pad Thai or noodle soup and had snacks of sticky rice flavoured with coconut. In the evenings Preecha took us to restaurants, night markets and riverside stalls for amazing dishes of grilled fish, firery curries and even deep fried bamboo worms (absolutely yummy). Thanks to Preecha, Rico and the Redspokes team for a memorable trip. This was an excellent trip through the most beautiful countryside of Thailand. The cycling was great. A carefully chosen route with lots of interest and variety. Some of it was challenging, but the rewards were spectacular. Our splendid guide Preecha looked after us admirably and found us imaginative places to eat both at lunchtime and in the evening and we stayed in some very comfortable hotels. I would happily do it again tomorrow! 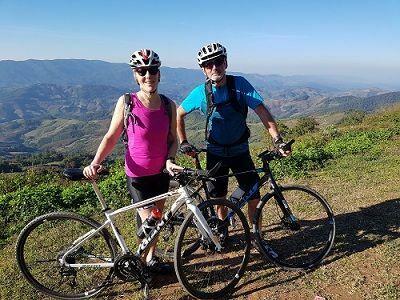 This was our first trip, both with redspokes and to Thailand, so we didn´t know what to expect when we arrived to Chiang Rai where we were met by our guide at the airport. It was a pleasure to cycle as the roads turned out to be in excellent condition and with surprisingly little traffic. Also, the drivers were very considerate of us cyclists. The cycling route was beautiful and challenging, with several mountain passes to cross. There were several days with long climbs of more than 1000m, partly on steeper roads than we were used to, but the reward came when reaching the top, with spectacular views of the surrounding landscape, and of course in the long downhill stretches. The temperature during our tour in January was agreeable, with a maximum of 26-28 degrees at mid-day and cooler at night, especially when we stayed over-night in high located villages, where a sweater was needed in evenings and mornings. Throughout the tour we got to try a lot of different delicious Thai food, introduced by our guide. All in all, we had a fantastic cycle tour and we will definitely consider travelling with redspokes again on a challenging tour. 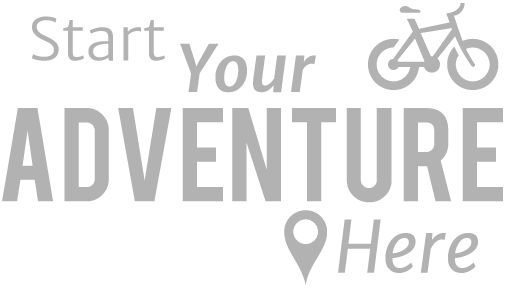 .... if you want pristine luxury and clockwork conditions do not do this trip, however if you have a sense of adventure and want a unique exhilarating insight into a culture and place where the physical challenges will test your values and attitudes this tour is it.
" .... if you want pristine luxury and clockwork conditions do not do this trip, however if you have a sense of adventure and want a unique exhilarating insight into a... "